Saturday will start warm and muggy with morning lows in the upper-70s. Highs will climb to the mid-80s. There will be breezy conditions as well, with easterly winds at 15-20 mph. There will be a few showers the first half of the day, then most of the showers and storms will be working their way over to the west coast of Florida. 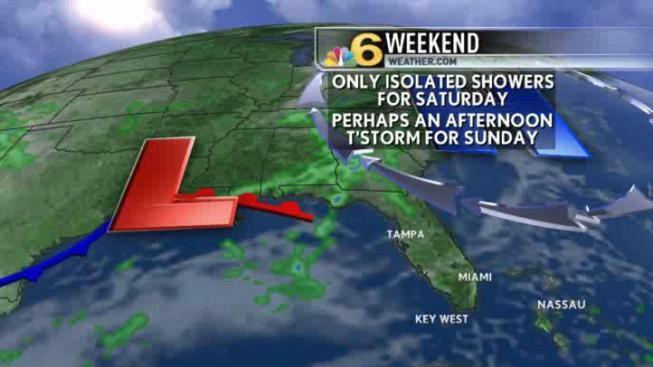 There will be fewer showers this weekend than earlier in the week. Saturday night will drop down to the mid-70s, with breezy conditions. Sunday will be much of the same, with a slightly higher chance for a shower. As the work week begins, a westerly flow will take over again, with a chance for those afternoon storms once again.